Similar to our Wedge Wire SB profile range, Wedge Wire SBB HS Profile provides a larger body which is slightly parallel at the shoulder to restrict wear of the manufactured Slot Gap. Ideal for heavy duty applications, this Wedge Wire SBB HS Profile range is also available in our standard grade materials and specialist hardwearing steel qualities, the HS range in particular being available in Manganese Steel. 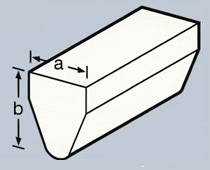 The data table provide theoretical values for the Wedge Wire SBB HS Profile only, as support rod type and pitch may vary in selected applications. 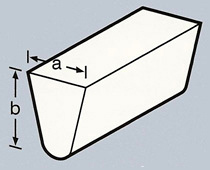 The welded Wedge Wire SBB HS Profile can also be manufactured with an inclined screening surface where required. Dedicated support rod profiles can be welded at intervals ranging from 6mm up to 100mm, depending on wire profile and Slot Gap requirements. Similar to our SB Wedge Wire profile range, Wedge Wire SBB HS Profile provides a larger body which is slightly parallel at the shoulder to restrict wear of the manufactured Slot Gap.